What can only be described as the Oscars and Fashion Week of the Residential Construction Industry rolled into one, the International Builders’ Show is THE place for builders, renovators, designers, sales/marketing professionals, suppliers and manufacturers to see and be seen. 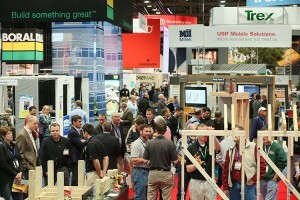 Hosted by the National Association of Home Builders each year at the Las Vegas Convention Center in Las Vegas, Nevada, the International Builders’ Show is comprised of three days jam-packed with education sessions, special events and exhibit halls filled with displays from every facet of the industry. Needless to say, Atlanta-based custom home builder and renovator, Highlight Homes was very excited to be there! Not only did we have an opportunity to attend enlightening education sessions and sit in on interesting industry segment forums, we also got a front row seat for the latest trends and up-and-coming manufacturers that might help shape the future of the home building/renovating industry. And the future is BRIGHT! This was the best attended show in the last five years. Optimism abounded throughout the exhibition halls. Based on our own observations, it’s clear that builder confidence is on the rise, which directly affects the health of the nation’s housing market. While our feet were tired from three days of walking mile-after-mile of exhibition halls and our brains were on overload from all of the stimulation we received, now that we’ve had a few weeks to digest all of the information – we are filled with inspiration and can’t wait to bring some of that excitement to Highlight Homes’ renovation projects over the coming months. Just as Highlight Homes looks outside of our own brains for inspiration from time-to-time, we always recommend the same to our clients. While our design/build team will bring our own set of enthusiasm, ideas and expertise to every project we undertake, that first spark of inspiration comes from the client themselves. That is often the reason they’ve called us – to take their vision and make it a reality. We’ve found that the best way to communicate that vision to us is through a “Dream Book.” Begin combing through home décor and design magazines, catalogues and websites – clip or print the pages that inspire you the most and compile them into your book. Feel free to draw pictures and take photos to add to the book, as well. Even though we can’t all be in attendance at the International Builders’ Show, inspiration can come from just about anywhere! For More Great Ideas on How to Begin Building Your Own “Dream Book”, Check Out Inspiration Accumulation! If you’d like to benefit from all of the excitement and enrichment that Highlight Homes has received from our recent trip to the NAHB International Builders’ Show, contact our team to schedule a no-obligation consultation. Call us at 678-873-9234, e-mail us at info@highlighthomesga.com, or fill out our online contact form. To learn more about Highlight Homes, please visit us online at www.highlighthomesga.com. While there, you can take a peek at our online portfolio. Who knows, you might just find the next perfect image there for your own “Dream Book”! What Makes a Great Room Great?